The follow-up to the world’s thinnest smartphone, the Moto Z, is on its way – and we now have a better idea of what its specs are going to be. 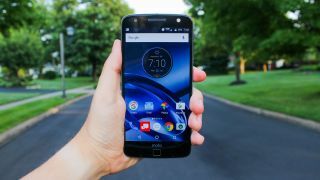 Thanks to reputable tech leaker Evan Blass we’ve known the Moto Z2 has been coming since April, but now the phone has appeared on benchmarking site GFXBench, and it’s looking a lot like a flagship device. The screen looks to be the same as the Moto Z at 5.5 inches, with a resolution of 2560 x 1440, making it a QHD competitor for the Samsung Galaxy S8, which comes in at 5.8 inches and 2960 x 1440 pixels. The post also confirms that it’s powered by the Qualcomm Snapdragon 835, featuring an octa-core 2.4GHz CPU and Adreno 540 GPU, as well as 4GB of RAM and 64GB of storage – allowing for the Android operating system and out-of-the-box apps, you’ll get around 47GB to actually play with. Contrary to leaked designs we’ve seen previously, the stats are only showing a single rear-facing 12MP camera with the ability to shoot 4K video, while the front-facing camera looks set to be 5MP. According to PhoneArena there's a Motorola event on June 30, so we'll possibly see the Moto Z2 made official then.